How Much Impact can 1 Pound of Fat have on your Knee Pain? Weight loss becomes much more challenging when you are dealing with knee pain. You know you need to lose weight, so you try your best to work as hard as possible to make positive progress. However, during your quest to lean up, you notice your knee pain is only getting worse! What a double edged sword! You need to lose weight to take pressure off your knee, but the more you exercise to lose weight, the worse the pain gets. What should you do? How much impact does one pound have on your knee? We tend to think that 1 extra pound of body weight adds one pound of pressure to the knee, but that would be inaccurate. Think about your walking motion for a moment. When you walk you transfer all of your weight from one leg to the other leg. There is a period of time when all of your weight is only on one leg and the other leg is swinging in the air. The impact you are having on your knee is not equal to one pound, but instead is equal to 4 lbs (specific to those with osteoarthritis in a recent study). That means that the extra one pound of fat (or even muscle) has an impact of 4,800 pounds for every mile walked. 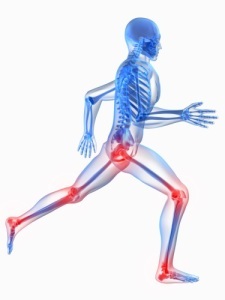 If you are ten pounds overweight, that is equivalent to 48,000 pounds of extra compression on your knee joint. If you were curious why your knee was hurting so much, this might give you a better idea as to why that is occurring. I call it an endless cycle for people with knee pain. You exercise to lose weight to take the pressure off your knee, but the more you exercise, the worse the knee pain gets. So what can you do to combat this? One of the first things that our crew at Medical Fitness Pros does is do an assessment on your knee. It’s important to see what the knee and the supporting structures are doing. Do you have a tight IT band? Are you not firing your vastus medialis correctly? Do you have swelling or have you lost muscle in your quad due to a previous injury or surgery? Do you have arthritis? It’s crucial that you discover what the problem is with your knee so that you can get back on track as quickly as possible. Once you identify the knee problem it’s important that your first step is taking care of the knee. But according to the article the weight is the problem, right? However, by pushing the body as hard as you can to lose the weight, you will potentially set yourself back with a more severe, longer term injury. So at Medical Fitness Pros we focus on nutrition as a crucial beginning step, along with low impact activity that doesn’t negatively impact the knee. As we build the strength back to the knee structure we can begin pushing our clients harder, helping them burn more calories, pain free. Some of the things we look at involve the vastus medialis recruitment, IT band, quad bulk, and range of motion. Every situation is a little different and it’s important that a program is individualized. With any joint pain it is a delicate balance between taking care of the joint and pushing someone so they get the results they desire. It can be very frustrating at times when our body doesn’t do what we want it to do. However, other body parts can be used during that time period to keep the progress going, and then as the joint gets better, you can start pushing it harder again. For us at Medical Fitness Pros, we have specific protocols that we use in order to ensure we are progressing at a safe pace. Moving too fast will only hurt the joint again, and we never want to see someone slip backwards. What happens when things aren’t improving? Sometimes the knee pain never seems to get better, and may continue to get worse instead. In that situation we advise our clients to see a physician in order to get it looked at. You can’t out exercise a meniscus tear. Even when you have temporary relief, there are times that a physician or surgeon may be the only option. We never wish that for any of our clients, but we have a duty to do what’s best for our clients long term results, no matter what. What does a Medical Fitness Pros program look like for someone with Knee Pain that wants to lose weight? When you come in with knee pain we perform a full assessment and consult with your physician (if they have seen one recently). Our job during the assessment is to help you know the best path to take to achieve your results. We will focus on a nutrition plan that will help you start losing weight. We will then devise an exercise program that is safe for you so you can achieve your goals. You will have homework that will be crucial to you getting the results you need (stretching, foam rolling, strengthening exercises). Our goal is to make you independent of us, so it’s imperative that you follow the directions we give you. We will focus on your entire body so you can start getting stronger and feel better. As your knee continues to feel better we will continue to progress your program. This is a recent testimonial from someone who came in to see us for knee pain. She wasn’t focused on the weight loss aspect as well, but she was dealing with a lot of pain when she came in. If you are suffering from knee pain and want to lose weight, give us a call at (281) 500-6055 or fill out the contact form below. We want you to succeed and fulfill your goals with as minimal pain as possible. We’ll work with you to get you on the right path to healthiness and happiness. Source: Messier, S.i, July 2005: vol 52: pp 2026-2032. News release, John Wiley & Sons Inc.
Jason Hodge, founder of Medical Fitness Pros, has been voted Best Personal Trainer in Katy, 4 times as well as Best Weight Loss Center, Best Wellness Center, and Best Fitness Center. He also chairs the Katy Area Chamber of Commerce Health and Wellness Committee and been published in magazines multiple times. He has 17 years of personal training experience and a Bachelor's degree in Kinesiology.